NOTE: The Full Wave Mat info page is → HERE. These are just field notes from Doc. A mini sluice (multi sluice) with adjustable extension was set up with recirc pool of cold water. No agents or soaps added to water. An 1100 gph pump was used with 5 feet of bilge hose. 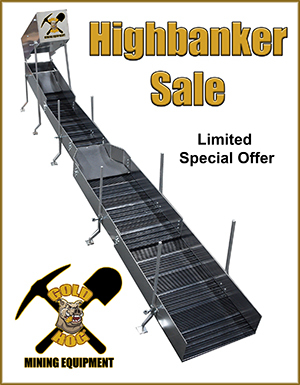 The LIFT was quite high, about 24” – 30”, so we’re assuming the gph was reduced to roughly 800 gph. Solid Wave Mat was used. Beach sands directly off the Juno beach area were used for testing. 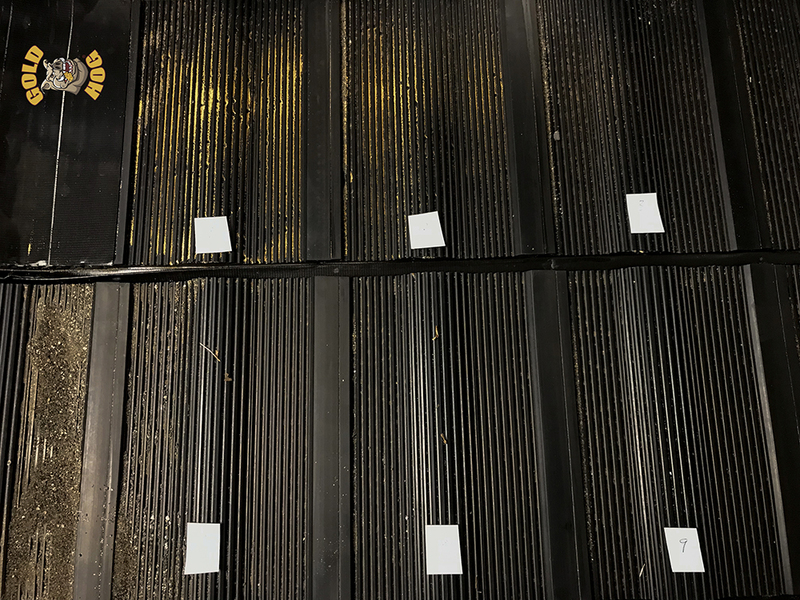 We screened some added gold, roughly 1-2 grams per run, via 100 mesh screen, so all the gold was sub 100 mesh. For each run only about a gallon of beach sand was used at a moderate feed rate. Run number one the upper sluice was set to toughly 22 degrees and the lower about 12. 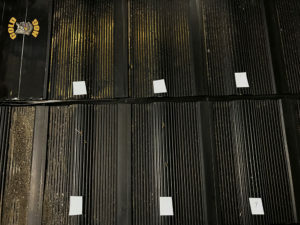 The upper mat was mostly blown out with only a small amount of gold showing in certain areas. 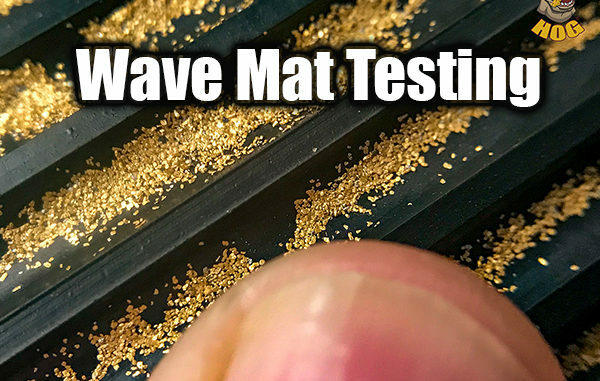 ZERO sand / non-gold material was left in mat. 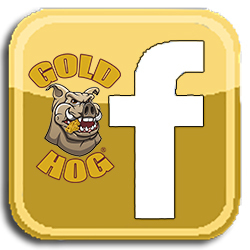 The lower section had many areas with solid gold deposits and very little non-gold / sand. This was considered our extreme blowout run. Run number two, the upper was set to roughly 12 degrees and the lower was about 7 degrees. More gold was found in the upper but gold was still lightly disbursed down the rest of the sluice. 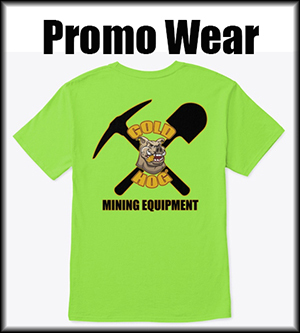 Tailings: on the first run we did not worry about tailings. We knew we were going to blow out gold, that was our goal. Second run we did test somewhat, and found a small amount of gold. Third run… a pan was left under the end of the sluice during the entire run. It was panned and AMAZINGLY, there was very little gold. Maybe 1-2% by weight. We were VERY impressed with the lack of turbulence vs. cleaning and capture power of the mat. Some jumpy small rooster tails were forming at higher pitches due to the low gph flow but nothing that seemed to impact the mats working ability. It’s a SMOOTH running mat. At the higher speeds the non-gold sand disappeared almost instantly. At the lower pitch runs you could see sand in the grooves for about 10 – 15 seconds. The particles were dancing in the little grooves and eventually most of this cleared out. We REALLY were trying to have the last mat hold more black sands, but to our surprise it cleared out even at 5 degree pitch. We’d like to see more testing on this. The lack of LOSSES on the lower / last run was actually shocking. We did not expect the mat to have a +98% capture rate on beach sands. We were shooting for more like 70 – 80 on that run. Shocking to us was just how CLEAN the mats were. Like scary clean. 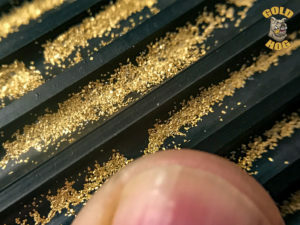 Many areas were just pure gold with ZERO sand or non-gold material. Reducing Impaction: All sluices that use any form of flow interruption, followed by a vortex / low pressure area, can suffer from impaction. 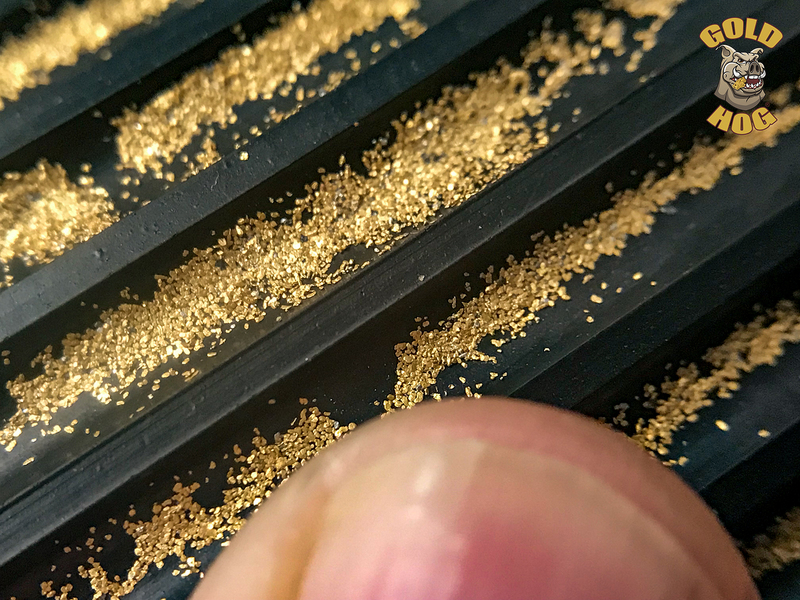 In plain English, the riffles or capture zones fill up with heavy NON-GOLD material and there is little room for fine gold to hide. 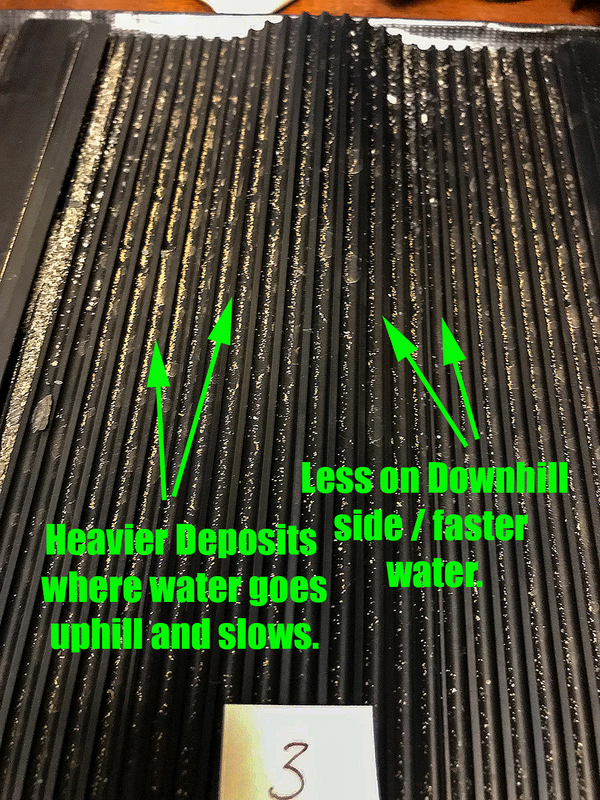 It’s why we do cleanups and often why hydraulic riffles are introduced in commercial operations. 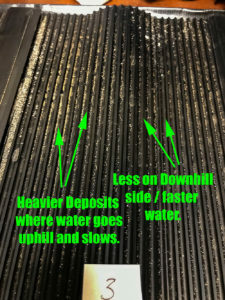 The Wave Mat on these runs had ZERO impaction. None… Nada… At first, on the last run, I thought the mats were still running too hot and we would still have losses. To my surprise losses were minimal even with the almost bare mats. The beauty of having NO RIFFLES or “larger vortex zones” was that everything we did NOT want to stay in the mat never got ENGAGED in the exchange process. It simply flowed on by. Click the pic to enlarge. I think it will be a great mat for beach miners, with a brain, and good for finishing sluices such as extensions or flares. More to come. 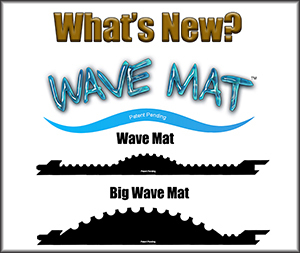 FYI… if you have a DREDGE… you’ll need to wait for the BIG WAVE mat.